The last time that I had been to Beirut was in 1982 during the Israeli invasion. I had escaped the bombing and terrible destruction on a small yacht, the Sea Victory, sailing from Jounieh in Christian East Beirut to Larnaca in Cyprus. The boat had been packed to the gunnels with families escaping the carnage but our crossing had taken almost three days as we were constantly intercepted by Israeli warships that forced us back at gunpoint. At the point of desperation, we had secured safe passage through the American consulate. Returning in 2005 after over twenty years was extremely emotional and I have to admit to being very apprehensive. The assassination of Rafiq Hariri, the former Prime Minister, a few days earlier on the main highway by the sea did little to allay my fears. A friend convinced me that I would be fine and arranged passage with a driver from Hezbollah. We arrived at nightfall as the city glittered below us and moved through Christian Ashrafieh and across the former Green Line, where snipers used to lie in wait for stray cars. I was shocked by what was to greet me. Gone were the bullet-riddled hotels and bombed out ruins. Gone were the checkpoints of local militias guarding their fortified ruins. In its place, a new city had emerged filled with modern boulevards, fashionable restaurants and modern hotels. We drove up the hill towards the city centre, where the driver deposited me outside my hotel, a tall, glass fronted building, the Gefinor Rotana. I showered and walked along the seafront towards Rauchi. 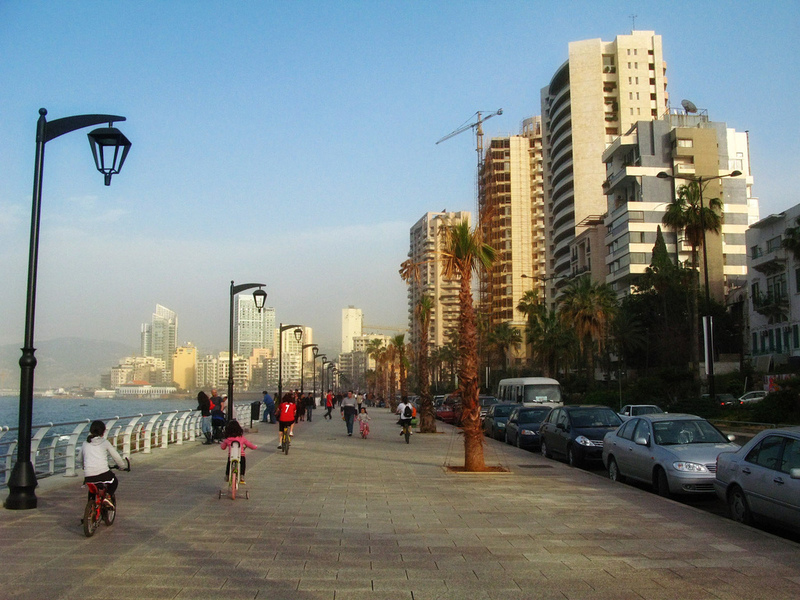 It was early evening and the people of the city congregated on the Corniche imbibing the sea air and chatting. Gardens are a premium in this city of apartment blocks and evening walks by the sea offer both escapism and the chance to socialise. I moved up across Hamra and searched for my friends who had owned an antique shop. They had had a son but were so frightened of him being kidnapped that they grew his hair, made him wear dresses and kept him indoors all the time. He took to roller-skating between their precious artefacts. Unfortunately the shop had been replaced by a large department store. I moved further down Rue Verdun searching for an Englishman and his Lebanese wife. We had often dined there in the troubles and had taken gin and tonics on his balcony as the Pink Panthers had fired their anti-aircraft guns at the F-16s circling overhead. I found the building, but no one was there. I left, tired and emotional and headed back and then spotted it on the corner. The Royal Garden Hotel had hardly changed at all. It had been my first stop when I had come to Beirut in 1979 and had been my refuge at the height of the troubles. I entered expecting them to recognise me but this was 25 years on and both the hotel and myself had grown old. Incredible story and a real testament to the Lebanese rebound, also glad you were able to leave Beirut safely. If you ever want to use any of my pictures just let me know! Glad that you liked it. These were difficult times to say the least but I always love returning to Beirut. Many thanks for letting me use your picture. Hello. Reading all of this has brought back memories in graphic detail. I was a crew member on the Sea Victory during that awful time. We were there on the day of the massacres at Sabra and Shatila, the missile attacks on Jounieh port, witnessing the absolute madness of it all. Thanks for all this. I was beginning to feel I’d imagined it all. I’ve never been back since then. I was 21 then. I’m 57 now.